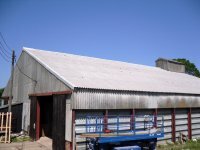 FIBRE CEMENT offers the perfect solution for most agricultural based roofs, including grain stores, general storage, barns, stables, cattle sheds, garages and many other applications. It offers some insulation value to a building and most importantly creates a drip free environment. Also a 30 year guarantee is available on request. As one of Cembrit's leading distributors we offer a wide range of products fixtures and fittings. We supply both traditional PROFILE 6 FIBRE CEMENTin natural grey, and as a coloured coated product. 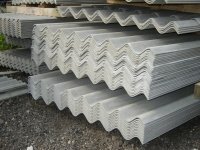 We also supply B5 PROFILE FIBRE CEMENT sheeting , which has smaller corrugation than the traditional profile 6 and is more suitable for smaller scale domestic projects such as GARAGES , STABLES, SMALL WORKSHOPS and COURTYARDS.